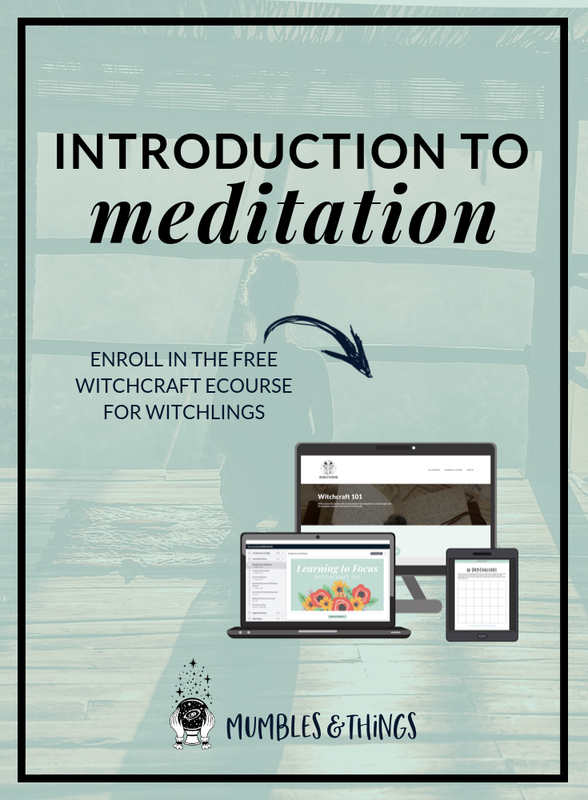 Meditation is an integral part of witchcraft and practicing magic because it is through intentional thought and focused desire that you communicate with the universe (or your higher power). Other methods include, ritual, spellwork and your everyday thoughts and speech. Meditation is a practice in which an individual trains the mind and induces a mode of consciousness to realize some benefit. There are many varied activities and practices which fall under the umbrella of meditation. These are discussed below. Almost every culture in the world has some form of meditation associated with it. No matter the style, they are generally designed to promote contacting spiritual guides, experiencing relaxation, building internal energy, receiving psychic visions, getting closer to the divine, seeing past lives, taking astral journeys, and more. Thoughts, emotions, dream images, energies, material objects, or anything else you can experience are all different manifestations of the same "stuff". This is the core insight of magic. The spectrum of consciousness runs from the densest kind of matter through many different levels up to the most subtle and abstract forms of spirit. Everything exists on all of these levels at once. So, when you experience the material object, what you're perceiving is simply one end of a pattern that extends to the heights of spirit. The material object is the most obvious form, but through meditation you can access these other levels of being and put them to use for magical purposes by working with their material manifestation. Pick up the nearest object to you at this moment. This object has a physical dimension: you can see it, touch it, tap it on a hard surface and make a noise you can hear, you might be able to smell it, and if you wanted to you could even taste this object. Your physical senses are designed to interact with things in the physical realm. This material object consists of molecules bound together according to a particular geometric structure. This is it's physical form. But this object—and any other object you encounter—also exists on several other levels. It has an etheric existence. It exists on a lattice of subtle energies that hold it together. If you've ever experienced the vibrations of a crystal, that is the etheric side of the crystal. Try it now: hold the point of a crystal about a quarter inch from the palm of your hand. You may feel a faint breeze or a tingling sensation against your skin. These subtle energies are not only important in magic, they are linked with life and breath. They are fundamental to many Eastern spiritual disciplines, meditation practices, martial arts, and healing traditions. You may have heard the words ch'i, ki or prana, which are respectively the Chinese, Japanese, and Sanskrit word for subtle energy. There may be an aura of mystery surrounding these practices, but the etheric energy isn't hard to experience. Western culture systemically ignores and actively suppresses us from being aware of the etheric experience, but you can receonnect. There are several other levels besides physical and etheric. The astral aspect is another mode of subtle energy. This energy can be described as "concrete consciousness" or "consciousness of form." This level is strongly affected by the astrological forces of our solar system. There is also the mental aspect of the object, which is beyond space and time, in the mental realm of "abstract consciousness" or "consciousness of essence." There is also the spiritual aspect of the object, the root essence of thing itself at the highest level of being. All this may seem a long way from the simple experience of a physical object resting in your hand. The point is that this sense of distance is an illusion. All the different levels of being are present in every object at every moment. The object you hold is all of these things, all at once: a collection of molecules, a lattice of etheric forces, a spiral of the space energy, a ray of abstract consciousness, and an emanation of it's highest self. The goal of meditation is to focus and quiet your mind, eventually reaching a higher level of awareness and inner calm. You can meditate anywhere and at any time. No matter what’s going on around you, you can access a sense of tranquility and peace. When you are in this state your magic becomes more powerful and effective. Form mental images of places or situations you find relaxing. Try to use as many senses as possible, such as smells, sights, sounds and textures. Use a guide, teacher, or recording to lead you through this process. A simple, natural technique which allows your body to settle into a state of profound rest and relaxation and your mind to achieve a state of inner peace, without needing to use concentration or effort. Choose a calming word or phrase, repeat it over and over to yourself silently to prevent distracting thoughts from entering. Allow yourself to be mindful, or have an increased awareness and acceptance the present moment. Focus on what you experience during meditation, such as the flow of your breath. Observe your thoughts and emotions, but let them pass without judgment. Concentrate on the seven primary energy centers of your body that align with your spinal column. Move from one to the next starting at the base of your spine to the top of your head. Allow equal amount of time for each chakra. Combination of meditation, relaxation, physical movement and breathing exercises to restore and maintain balance. Qi gong (CHEE-gung) is part of traditional Chinese medicine. Perform a self-paced series of postures or movements in a slow, graceful manner while practicing deep breathing. Tai chi (TIE-CHEE) is a form of gentle Chinese martial arts. Perform a series of postures and controlled breathing exercises to promote a more flexible body and a calm mind. As you move through poses that require balance and concentration, you’re encouraged to focus less on your busy day and more on the moment. Pray using your own words, or read prayers written by others. Reflect on the meaning of the words or write in a journal. Use prayer beads as a tool to help keep you focused. A doctor attaches electrodes to your body to monitor blood pressure, breathing, heart rate, and muscle tension. A therapist will study your reactions and teach you how to reduce the types of stress you experience. 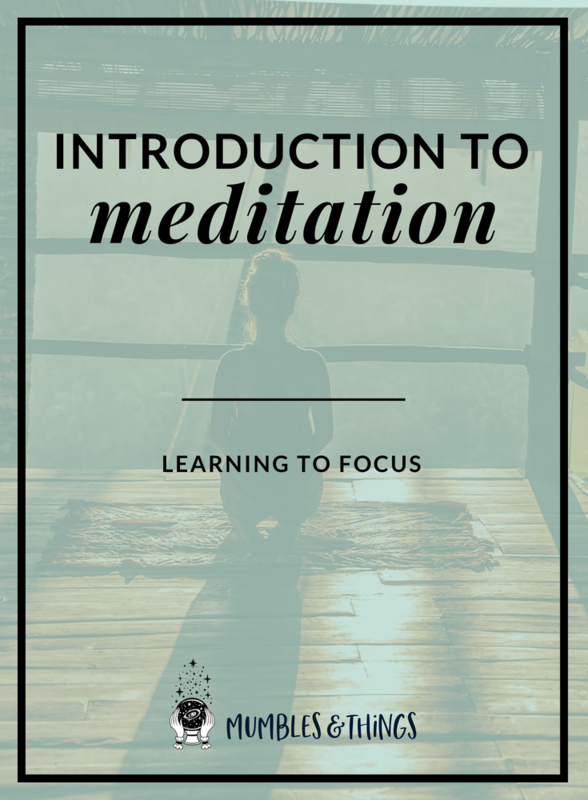 While the forms of meditation vary, they all follow a similar format and use concentration techniques, which help to align your thoughts. When the mind is calm, you can experience total peace and empowerment. Here is a basic formula to follow when meditating, manifesting, casting spells and living your life intentionally. Move into your meditation posture of choice. Relax, close your eyes, take several breaths and become still. Focus your attention on gratitude. This will lift your spirits and raise your vibration. Express your thankfulness out loud or simply keep it in your mind. Align yourself with your higher power: the universe, spirit, a specific god or goddess, whoever your spiritual sky boss is. The universe is mind, and the mind is universe. Using specific, simple language, express exactly what you desire. Focus on this. Feel the emotions, sensations and vibrations associated with having what you want. Become the person who already has it. Let your subconscious and conscious both believe this. Express gratitude to your spiritual sky boss for helping you achieve your dreams again. With so many ways to experience meditation and to access the other realms of being, there's no reason not to start today. This worksheet is designed to help you start your habit and stick with it. Doing the same thing every day for thirty days, is scientifically proven to change your behavior from an interest to a habit. 💃Yes! - You meditated for at least 20 minutes. 🤷‍♀️Sort of - You meditated for less than 20 minutes. Use color (my preference is green, red and yellow), symbols (🙂,☹️,😶 or➕,✖️,➖ etc.) or just write in the box what you did. There are many reasons to track your habits in a visual way. The reason I like this method is because it shows your potential. By this, I mean that you recognize that you are human, and you may miss one or two days. Say you start out strong and do seven days in a row then on day eight you or a family member gets sick, or you're really busy at work. You miss that day. Now, if you were not keeping track in a visual way you wouldn't be able to compare this one red square to all seven of the green squares. AND you wouldn't be able to see all the beautiful blank spaces that have the potential to be green. You may think, "Oh well, that was fun while it lasted. I guess meditation isn't for me." and you'd give up. But if you looked at your chart and saw only one red square in a sea of green you might have the motivation to try again the next day. And the day after that. And the day after that. Click the button below to submit your name and email. As a member of the Mumbles & Things Community so that you can access all the other goodies in the Resource Library. Follow my Meditation Board on Pinterest. 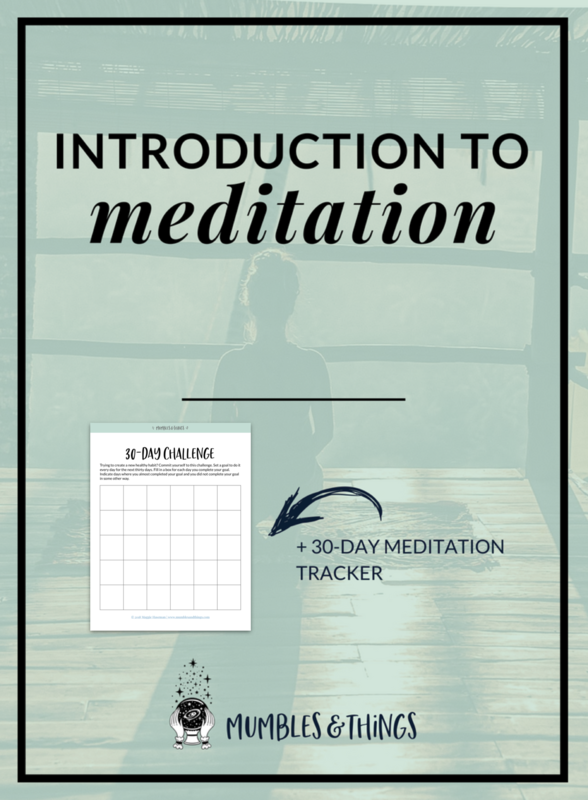 Do you practice a form of meditation? Tell me about it in a comment below.